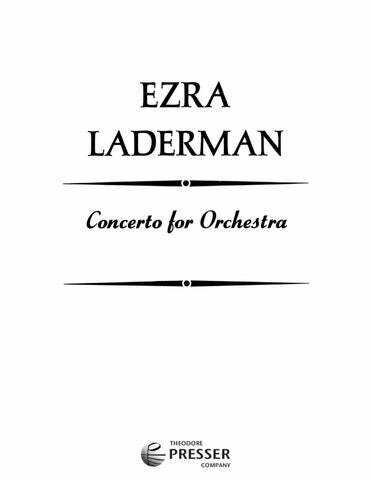 Ezra Laderman was born in Brooklyn, NY on June 29, 1924. His parents, Isidor and Leah, both emigated to the U.S. from Poland. Though poor, the family had a piano. Ezra writes, “At four, I was improvising at the piano; at seven, I began to compose music, writing it down. I hardly knew it then, but I had at a very early age made a giant step to becoming a composer.” He attended New York City’s High School of Music and Art. Laderman studied composition with Stefan Wolpe, and with Otto Luening and Douglas Moore at Columbia University. He has taught at Sarah Lawrence College and at the State University of New York at Binghamton, where he also held the position of composer-in-residence. He has also held the position of composer-in-residence at Yale University. He has received three Guggenheim Fellowships and the Rome Prize, and had residencies at the Bennington Composers Conference and at the American Academy in Rome. On April 25, 1943, Laderman was inducted into the U.S. Army and served as a radio operator with the 69th Infantry Division during World War II. Laderman writes “we were in Caversham, England poised to enter the war. It was here that I learned that my brother Jack had been shot down and killed in Germany. The Battle of the Bulge, crossing the Rhine at Remagen, liberating Leipzig, meeting the Russians at Torgau on the bank of the Elbe were the points in this constellation that was filled with tension and waiting, victory and grief. We became aware of the horror, and what we now call the ‘holocaust,’ while freeing Leipzig.” During the weeks after the war was over, Laderman composed his Leipzig Symphony. This work brought him recognition within the army, and subsequently he was assigned as orchestrator of the GI Symphony Orchestra. Laderman was discharged from the army on April 22, 1946. Mr. Laderman’s compositions range from solo instrumental and vocal works to large-scale choral and orchestral music. His ten string quartets and his concertos for piano, violin, viola, cello, flute, string quartet, and double winds are notable contributions to the repertory. Mr. Laderman incorporates a lyrical style into a contemporary context, using tonal material in combination with atonal or aleatory elements, and seeking out unusual formal structures for his compositions. Commissions have come from the Chicago Symphony, Philadelphia Orchestra, New York Philharmonic, Los Angeles Philharmonic, Minnesota Orchestra, National Symphony, Louisville Orchestra, Pittsburgh Symphony, Dallas Symphony, Denver Symphony, Houston Symphony, New Jersey Symphony, Detroit Symphony, New Haven Symphony, CBS-TV (the oratorio Galileo), the Library of Congress and other orchestras, in addition to commissions from such distinguished artists as David Shifrin, Yo-Yo Ma, Emmanuel Ax, Aldo Parisot, Jean-Pierre Rampal, Judith Raskin, Elmar Oliveira, Julius Baker and Robert Bloom, Nathaniel Rosen, Toby Appel, Leonard Arner, Eugene List, Erice Morini, Samuel Baron, Lenox Quartet, Composers Quartet, Tokyo, Audubon, Colorado and Alrads Quartet. Mr. Laderman’s opera, Marilyn, based on the life of Marilyn Monroe, made its premiere at the New York City Opera in 1993 and the Symphony No. 8 received its New York premiere by the New Haven Symphony in Carnegie Hall in 1994. David Shifrin and the Chamber Music Society of Lincoln Center premiered Mr. Laderman’s Clarinet Quintet at Alice Tully Hall in 1994. Recordings of his music include Concerto for Double Orchestra with Hugh Wolff and the New Jersey Symphony (New World), Citadel, Sanctuary, and the Violin Concerto with the Louisville Orchestra and Lawrence Leighton Smith, conductor (Louisville), and Quartet No. 7 Colorado (Albany). Mr. Laderman was Dean at The Yale School of Music from 1989 to 1995 and taught music composition there up through June of 2014. He died on February 28th, 2015 at the age of 90. 1 0 1 1 – 1 1 1 0; Pno. Vln. Vcl. for Soprano and Ensemble Solo Sop. ; Vln. Vcl. Fl. Cl. Pno. 1 1 1 1 – 1 1 0 0; Timp. 2Perc. Pno. Hp. Str. Concerto for Orchestra 22:00 3(Picc.) 3(E.H.) 3(B.Cl.) 3(Cbsn.) – 4 3 3 1; Timp. 2Perc. Cel. Hp. Str. 21:00 2(Picc.) 1 2(B.Cl.) 1 – 1 1 1 1; Timp. Perc. Org. Str. 17:00 Solo Pno. ; 2 2 2 2 – 2 2 2 0; Perc. Str. Opera in 1 act. 45:00 1 0 1 0 – 1 0 0 0; Perc. Pno. Str.